The Singapore River Challenge mimics the world of early traders in Singapore. Your team will be traveling along the Singapore River on the River boats as the early traders had done. Seek the different merchants to earn precious goods, crucial for your final challenge. The daunting challenges will require your team to complete both Brain and Brawn tasks. When you have collected all the cargos, race back to the Marina Barrage and prepare yourself for the final challenge! 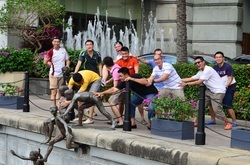 “The Singapore River Challenge allows our team to enjoy a nice cruise on the River boat. However, the merchants in the game are always ready to challenge our wits! Both relaxing and exciting, we can't ask for more." Book this Teambuilding session now!